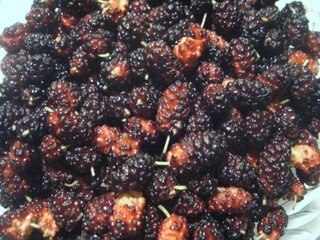 'The Joy of Cooking' says, "Purple-fruited mulberry trees are best suited, in our opinion, for varying diets--and flexing the muscles--of marauding schoolboys." Cute, Irma, but I'm not so high-faluting as to deny mulberries the effort of jam or cobbler or pie. I can remember, when I was too small to reach even the lowest branches, climbing up on the fence and balancing precariously to reach the most perfect berry that was just out of reach. They look sort of like a blackberry (no relation), but have only a mild tartness to them. And a different texture. The seeds are more tender and the green stem is actually kind of tasty. The purple mulberry is closely related, but not to be confused with the white mulberry, which is the tree that silkworms feed on. More romantic, but less tasty. I picked about a gallon of berries. There is a real art to picking mulberries. If they fall, they pretty much squish and aren't so awesome anymore. But if they are really ripe, then they will fall off the tree so so easily. 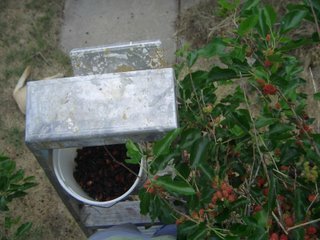 So you have to get good and judging which berry is most ripe - and be ready to catch the ones nearby that are also ripe enough to fall when you brush by...I think the next time I pick mulberries, I'll just put down a sheet and shake the branches. 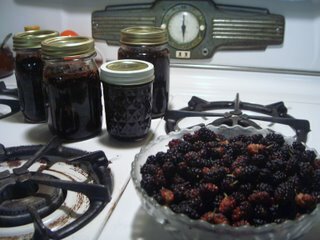 Despite "the Joy's" admonition, I decided to make mulberry jam. I saved a few back for tomorrow morning's pancakes and put the rest in a big pot. Then I covered them with sugar, until none of the berries were showing. (mulberries are pretty sweet, so you don't need to use as much sugar as you might for blackberry jam - maybe half as much volume of sugar as berries) Then I squeezed in the juice of three lemons. I had a couple of oranges to use up, so I grated the rind of one orange into the pot and also a bit of orange juice (honestly, I couldn't resist drinking most of it). I boiled it for maybe an hour. The longer you cook - the thicker the jam will be. A neat trick: put a plate in the freezer, then when you want to know how the jam is going to set up, drizzle a little on the cold plate. After a short bit, the syrup will be cooled down enough to get a sense of how thick it will end up. Once I was satisfied with the thickness, I funneled it into just-boiled jars, wiped the rims, and put the tops on. A little over a half-gallon of mulberries made 3 and 1/2 pints of jam. They are cooling right now. I SO love the 'pop' sound of canning lids sealing down. 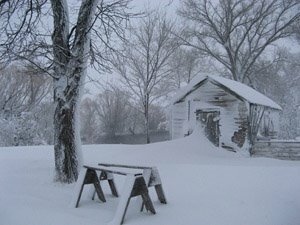 I have my music turned down low so that I will be sure to hear them pop once they've cooled down enough. Sounds delicious. Its amazing that you can go up for a snack and turn it into a project. How I wish I could be so spontaneous. Where would I fly into again? 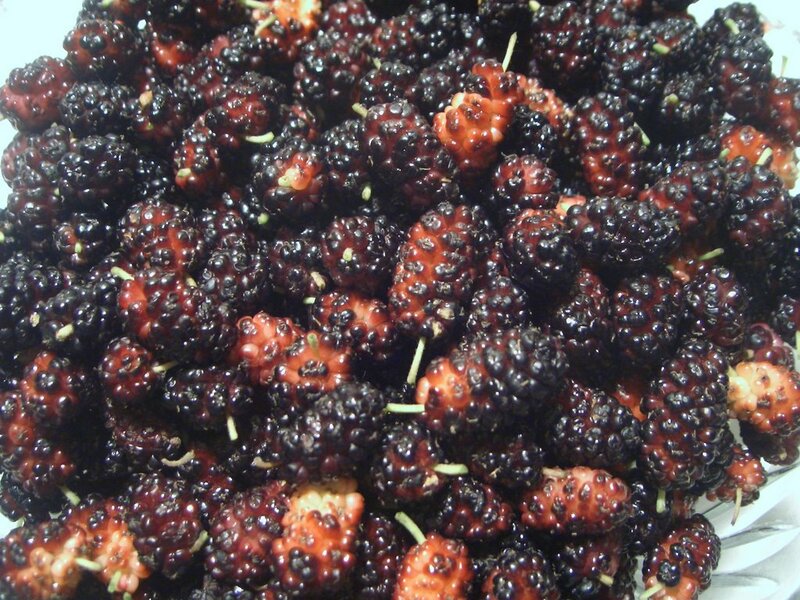 I used to eat mulberries on my way to Bernie's Beach every summer when I was a kid. They'd stain the sidewalk purple, and your hands and your tongue. 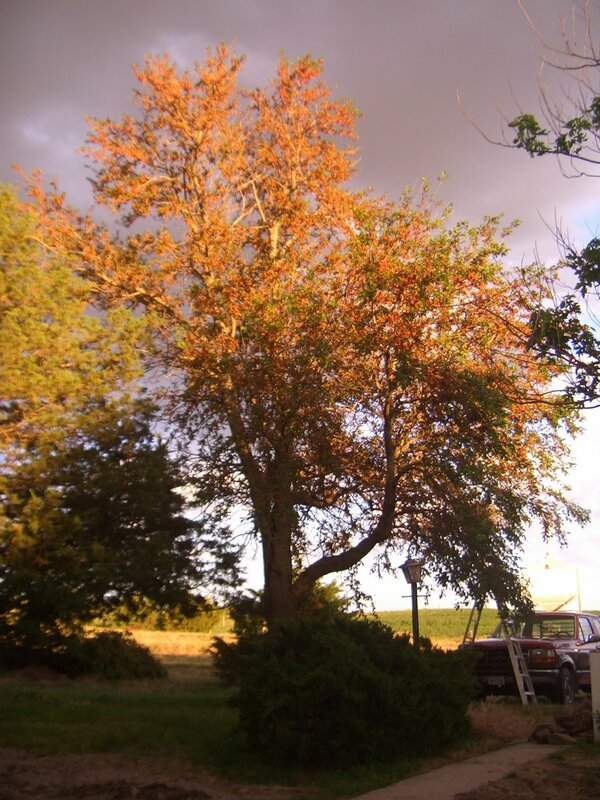 yeah I found this recipe in your archives...our mulberry trees are ready and I am ready to start canning. Thanks for your easy recipe! We used to watch the birds fall out of the tree near our kitchen as they would eat so many of the berries they would get drunk... was a sight to see.